I was actually looking at the Tags page and was surprised to discover that I had covered this subject more times than necessary. So this is definitely. Absolutely. The very last time. You are asking what is this football/xmas music like. Is it as bad as you imagined ? Yes. It is. After this you will not be taking part in any more seasonal celebrations. This football and seasonal music madness wasn’t exclusive to our shores you know. Bayern Munich were affected too. Just like Spurs they also had the curse of this one musical act constantly associated with them. The artist was one Andrew White (or Weiz in Germany) who was like The Hoff – as in an American who found fame in Germany… well not all of Germany, just the Bayern region. These tracks, in keeping with the theme, was a Christmas one and although it says Andrew White and the Bayern team, I’m not certain how much involvement they had. As mentioned he had a number of collaboration, check the Bayern Munich tag for more. – Next we go to Italy and a song done by a collection of footballers playing in the Italian League at the time. This as you will see was done for charidee (mate), but that doesn’t excuse them from putting out this effort. 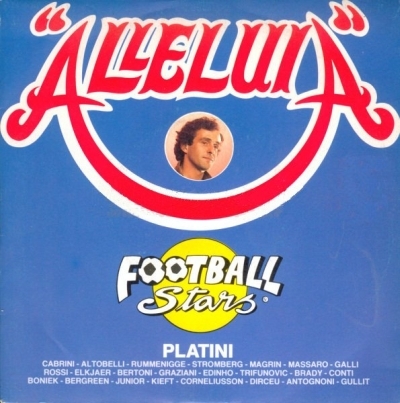 Hallelujah (Alleluia) is a pop song for charity (in support of Caritas) released in Christmas 1986 and sung by a group of players (accompanied by a chorus of kids) from the Italian league (plus Ruud Gullit , who had played the following year), which met for the occasion under the name of Football Stars. Right then I see by the number of angry faces out there that I must take my leave very soon.